Metro’s bus yards at Sunset and Main Street in Venice. Image from Google Street View. L.A. City Councilmember Mike Bonin has begun championing the redevelopment of an obsolete Metro bus yard in his district into something that the westside of L.A. County is desperately short of: affordable housing. The 3.5 acres of prime Venice land — located at Sunset and Main — is a mere stone’s throw away from the Boardwalk in one of the most expensive real estate markets in the country, which is exactly why Bonin, who also sits on the Metro board of directors, says this is the spot for affordable housing. But, of course, not everyone agrees. In a recent op-ed in The Los Angeles Times, Conor Friedersdorf argues that the project is a “wildly inefficient,” mostly symbolic approach to addressing the growing housing affordability crisis. It won’t really make a dent in the housing shortage that is driving down vacancy rates and, consequently, driving up rents, Friedersdorf argues. It’s a reasonable question, but there are few very compelling reasons why Bonin’s plan is exactly what the westside needs. One point that Friedersdorf makes is undeniably true. This proposal will not solve the housing crisis facing the region. Decades of under building housing have caught up with Los Angeles County, especially on the cost, driving rents and home prices to some of the highest levels in the country. “If eight-story apartment buildings were allowed on Venice Boulevard west of the 405; if they rose up on Venice’s stretch of Lincoln Boulevard too, displacing the auto repair shops and carwashes; if homeowners could legally rent their alley garages to lower-income tenants; and if developers weren’t forced to set aside so much land for parking, rents would come down. And enough non-rich people would live here to sustain a diversity of businesses to serve them,” Friedersdorf writes. But, it’s clear that the process of densifying neighborhoods where density is most needed will be a long and painful process. In the meantime, affordable housing is essential for undoing the planning trends that have turned Los Angeles into one of the most economically segregated cities in the country. Friedersdorf asks wouldn’t it be better to sell of this land and build affordable housing elsewhere where it’s cheaper. In a recent story about Bonin’s plan, The Argonaut reported that Metro estimates the value of the property to be between $30 and $50 million. While it theoretically sounds like a good idea — simply taking the cash from selling the bus yards and finding a cheaper location — the reality is that it’s not that simple. “Projects are getting harder and harder to do because of the cost of land. On the Westside in particular, it’s very difficult to make affordable housing pencil out. … Take away the land acquisition cost and now you’re only talking about development cost, which is a very different equation,” Bonin told The Argonaut. Recognizing this fact, Metro recently updated its joint development policy to assure that it used the land it owned to help get some affordable housing located in transit-rich areas. As Metro CEO Phil Washington noted that if lower-income households continue to be displaced farther and farther from the transit network, he would have to build the transit network out to them. “Workers who earn less than $25,000 and live within half a mile of a transit station are three times more likely to take transit,” Washington told The L.A. Times last October. The Venice bus yards site is actually in the service area of two transit agencies: Metro and Santa Monica’s Big Blue Bus. At this point, the planning for the Venice site is in the very preliminary stages. But, Bonin has outlined a vision that is very much in line with Metro’s joint development policy. L.A. County Supervisor Sheila Kuehl, who also sits on the Metro Board of Director and whose district the property is in, has cosponsored the plan. It’s also worth noting that the parcel isn’t currently zoned for residential; it’s zoned for commercial use. Bonin has said that as a result, if the parcel were sold off, it would likely result in a commercial development. Housing, especially affordable to those people who may be commuting to work into Venice, could actually take cars off the street. A commercial development, however, could lead to more cars as more people commute to work. It’s unlikely that land costs a mere half-mile from the former bus yards are cheap enough to make a swap worth it, like Friedersdorf claims. However, it is exactly in the places where land costs are so high that affordable housing is needed. Concentrating affordable housing exclusively where where land costs are cheaper — usually because they are less desirable places to live — can prevent lower-income families from accessing high-quality jobs and better schools for their children. Venice, as well as its surrounding neighborhoods, have seen major growth in quality jobs over the decades and while adding some affordable housing on a site in the middle of an economically booming neighborhood won’t help every household in need in Los Angeles, it can make a world of difference for those who do get to live there. Even so, Friedersdorf hits the point home that the proposal isn’t going to solve the region’s housing crunch alone. With vacancy rates in the region hovering below three percent, people who are looking for places to live are placed at a tremendous disadvantage compared to those who are already comfortably housed. In a place like Venice, where relatively few new homes get built each year, it means wealthier renters are going to beat out middle- and lower-income renters for coveted apartments simply because they can pay more. Adding a couple dozen more units to the market won’t tip the scales. Still, adding some homes is better than adding none in the midst of a housing shortage. “It’s fair to ask what the most effective things are to make a community more affordable,” said Mott Smith, principal of the development and planning firm Civic Enterprise. Real change will mean rethinking our land-use policies, reducing parking requirements, and densifying. “But if part of your strategy is subsidized low-income units, then building on public land is probably the most efficient way to deliver them,” he said. The plan to redevelop the Venice bus yards with desperately-needed housing may be, in part, symbolic. But, it is a step in the right direction and, hopefully, an indication of things to come. Now, if only Metro could somehow reacquire the old Pacific Electric (?) right-of-way that terminated in that transit vehicle yard! Then one day, below an affordable- or mixed-income housing complex, a light rail line could run down Venice to connect with the Expo Line at Culver City Station. I’m not holding my breath. Of course, just a year ago Metro staff tried to make the case to keep the bus yard open. 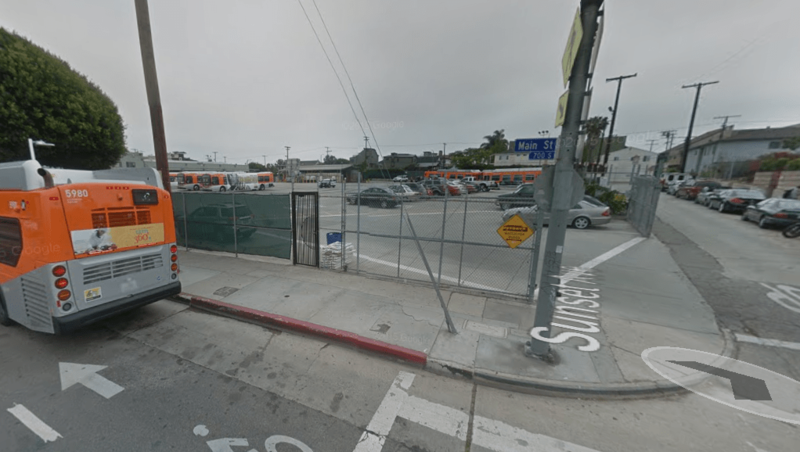 Unless Metro is going to ink a contract to have Santa Monica Big Blue Bus run bus bridge service for the inevitable train-car collision or suicidal pedestrian, the facility was better off as a bus yard. Expect delays in the event of Expo Line incidents, or crush loads on the parallel bus lines as the “risk allocation matrix” continues to slash what little remaining slack there is in the system. Metro really needs more yards on the west side of town, despite the longer drives for most of their employees who are coming from east of the 110, to provide reliable service to the westside communities. Fantasy. The west side is a premium location. While there may well be an argument for affordable housing in that side of town there is no viable real estate scenario/formula what will make the rents come down. If eight-story apartments were allowed on Venice Boulevard the developers would build for luxury it’s what they do. The only affordable housing that will be built is the mandated kind and that won’t affect the rental rates an iota. The preponderance of “luxury” housing is a direct result of decades of underbuilding. Arguing that we ought not to build more today would only perpetuate the problem. Old luxury housing eventually decreases in value over time; while it’s true that the Westside will probably always be more expensive than other parts of the county, the lack of housing construction over decades has made the disparity much, much worse than it needs to be. I’m not arguing that we shouldn’t build more –only saying that the “more” you will be building when it comes to premium locations such as the west side will be more of the same. It won’t make the rents come down –at best, and it’s a long, long shot, it will keep the rents at status quo. Given that west side rental rates are 25-45% greater on the west side it’s hardly an affordable alternative. Developers are in the business of making money –the most that a given market can bear. The yields on that side of town are too great for a developer to leave money on the table –unless of course they’re subsidized/mandated to do so. No developer is going to build so much as to make the rents go down. That’s crazy talk. They’re building to make money not to lose it. Building luxury housing where the market supports it keeps rents down in other areas. What happens to a wealthy person when we don’t build a luxury unit? Do they cease to exist or use their resources to compete for other housing, bidding up prices of existing housing? Perhaps that’s true but Freidersdorf is suggesting that if Venice Boulevard were to allow 8 story buildings and that if all the homeowners could legally rent their alley garages to “lower income tenants” as well as altering the parking requirements then rents would come down locally. That’s nonsense. Additionally, it is vital that new housing does not displace older existing housing stock, in part because that’s the housing stock that will see rents decrease as we allow for newer housing to be built. I don’t disagree with any of what you’re saying in principle. I’m suggesting that if one sincerely believes that a city can build it’s way out of a housing crisis –and Los Angeles genuinely has one– then suggesting that by doing so ‘rents will fall’ is an irresponsible way of gaining support for such an undertaking. High rents, while an indicator of a supply deficit are also an indicator of a prosperous community. Low rents are what comes when an environment is either over-supplied or economically depressed. Los Angeles, particularly the west side, is a prosperous city. High rents are baked in to that side of town because more people want to live there than can ever live there. Anyone who claims otherwise has an ulterior motive for building more on that side of town. I do believe rents will fall, not necessarily for newly-constructed apartments in which we require way too much parking, but for the older housing stock that is renting at absurdly (and artificially) high rates because of the housing shortage. As I noted, other high-demand markets like Seattle are already seeing rents fall as a result of progressive growth policies. Admittedly we have a long way to go, but I don’t think it’s impossible. Even if I am wrong, and the best we can hope for is to stabilize rents, that would be preferable to the extreme distortions we are seeing today. According to the article you linked the rents in Seattle are not falling –they’re rising at a slower year-over rate. The rents in Seattle are still going up even if it’s not as quickly. There’s speculation that the rents “could go negative” but it hasn’t happened. That’s what I get for skimming faster than I should. Anyway, I think you make some good points and it is important to have realistic expectations, though we are unfortunately only able to speculate at the moment about how a sudden glut of housing would impact rents. Hopefully, one day, we’ll actually be able to see the real results from smart growth policies in our region. And if they are going to sell the yard, they need to get full value for it and use the proceeds of $30-$50M for projects on the Westside not some give away which Bonin is planning. Lets let Metro concentrate on transit and mobility not trying to be a land provider for affordable housing, which is not its mission. CicLAvia returns to the Heart of L.A.! Also affordable housing, Gold Line first/last mile, and climate resilience.